Some business owners ask why should they care about a few negative remarks posted on social media? The truth is, business owners/managers should care extensively about negative remarks as a wildfire can spread in hours and a social media disaster can significantly destroy a brand’s reputation literally “overnight.” Recognize that any online content, good and bad, will impact how the consumer views your business. Having a plan or policy in place is critical to brand survival. Since social media is “public,” anytime something bad is posted about a business, the entire social media audience can see it. Some may feel that one “bad” comment doesn’t hold much influence, but the problem is one bad comment can grow into many bad comments very quickly and improper conclusions can be drawn; thus, damage of a brand’s image, sometimes very extensively, can happen in just hours. If the issue escalates, the disaster may become challenging to manage. Research reveals that “83% of consumers say online reviews influence their perceptions about companies and 80% report that negative online comments changed their purchasing decision” (eMarketer.com). So where do you begin? 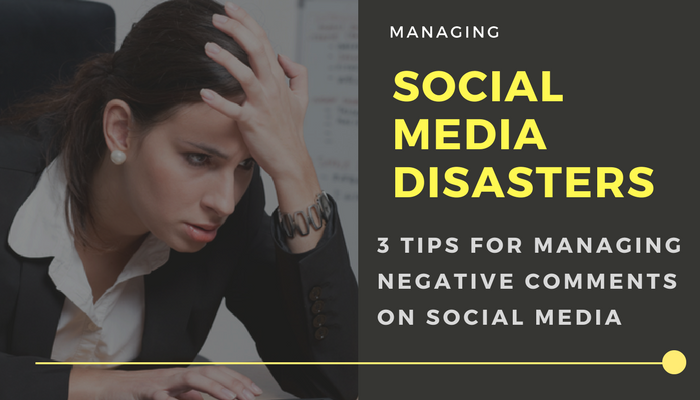 What are some tips before, during, and after a social media crisis? Tip 1 (Before): Have a plan and know everywhere your business is mentioned. Have one person in your organization handle this aspect of operations. This needs to be an individual who knows and understands social media and the brand, who will represent the ideals of management, and has a professional governance as part of their nature. This is not the youngest employee who has a Facebook page and Twitter Account. This is someone who is trained in customer service potentially more than any other employee in your firm. This individual needs to continually monitor social media channels. You may not realize that negative activity is happening; therefore, diligently checking different social media sites on a schedule is important and utilizing tools available is critical. There are several tools that can help. Some examples, some of which are free, include Google Alerts, Ice Rocket, Social Mention, or set up SemRush brand monitoring. Respond timely: Many industry experts contend that negative comments should be dealt with within 48 hours or less, especially depending on the amount of additional comments that may be generated from the original one. Some studies indicate that over 50% of the posters want and expect a response within hours of the original post. Reflect that the brand’s reputation drops every hour that no response is made. Deleting negative comments: If the social media post is on a site that you have control over, consider deleting only those truly “unreasonable” comments. However, most experts agree, do not delete the real negative comments as leaving them can make a company look more genuine and real. A company with no negative remarks may seem suspicious; plus, by not removing negative comments that you have responded to indicates to other potential negative posters that you will respond. This may discourage it. Tip 3 (After): Continue to monitor the past situation and look for ways to improve, if the complaint was applicable to business practices. Countering further issues and then posting content that can help strengthen the brand after a bad instance is important.